It has been f-ing cold and rainy for the last few days. I called my American west-coast family and they are trying to deal with all the heat while I chat in a wool sweater. We haven’t lit the fire, but it is so tempting. Cold, cold, cold. Today, Otto and Minty went on a hike. They brought food, water, heating-upper bits and chocolate. Right around chocolate course, it bucketed down. A true, hard, Sydney rain. They ran in, dropped their supplies and then ran out to catch the big drops. Otto ran under cover. Otto: Mom! I’m in a rain prison!! 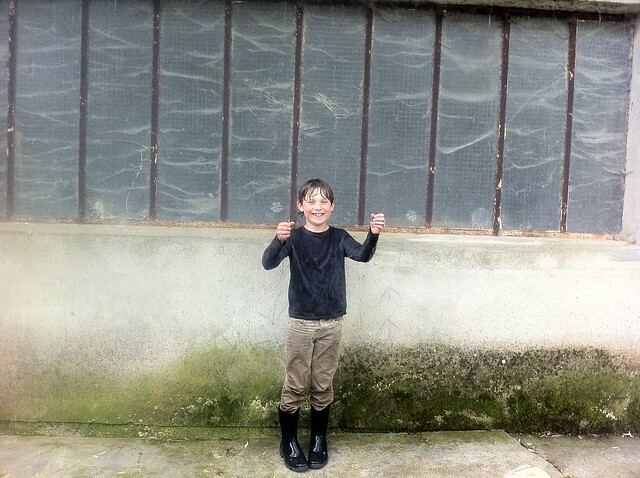 Otto: Look, I’m holding the rain bars!